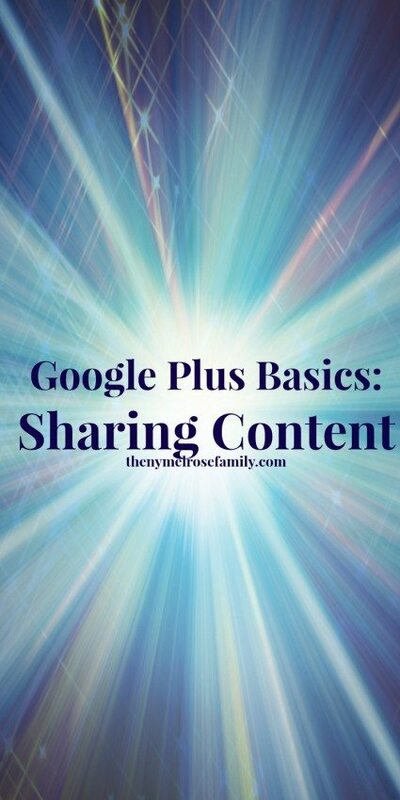 At this point in the Google Plus Basics Series you are comfortable with the basics and you’ve set up your Profile and are confident with Maximizing Your Posts. Now, it’s time to start sharing content. I use the rule of 80/20, 80 % other plussers’ content and 20% my own. You have to remember that Google+ is a community and in order to gain interaction, you need to be interacting with other and what better way to do it then to share amazing content! Something to keep in mind throughout the video is that in order to share others’ content you need to have circled some people already or you need to search for content that you’re interested in. Next week, I’m going to show you exactly how I search for content so be sure to subscribe to my YouTube if you haven’t already, but for now let’s assume that you have some people in your circles from the recommended list that G+ gives or from blogs that you read on a daily basis. When you’re sharing content of other plussers make sure that it is set up to Maximize their Exposure. You want to see a large image with the url included. Comment on the post. Before going to share I always leave a comment about how I like what they’ve shared. When I’m commenting I make sure to tag the person in the comments because it will send them a notification that I’ve mentioned them. Everyone likes to be talked about so be sure to grab their attention by doing this. Next you’ll want to hit the arrow that’s down at the bottom, which will bring up a box above the post to share the post. Create an Introduction. You want to tell your community why it relates to you and what you like about it. People want to be able to relate to you so give them a story of how it connects to you. Whether it’s the fabulous recipe or the gorgeous Valentine’s Day decor, explain the connection that you have to it. Tag the Person. You want to let that person know that you have shared their content. To do this, simply use the @ or + symbol before their name and a box should pop up with their name. Click their name and now it is hyper-linked to their profile and they will get a notification that you mentioned them in a post. This will give you more interaction because they will most likely come over to thank you and plus one your post. It also gives them a chance to gain new followers because people who are following you will likely add them to their circles. Use Hashtags. If hashtags are already there, then they will transfer with your share so don’t worry about adding them. If there are not any hashtags and it was a Super Bowl appetizer, I would add #SuperBowl as a hashtag so that it gets more exposure. I also offer Google Plus Consulting Services for the beginner to the advanced user, which you can find here.